Date Added: Friday 12 October, 2018 by Andrew M.
Date Added: Wednesday 28 March, 2018 by Andi F.
Date Added: Wednesday 20 September, 2017 by Christopher S.
Date Added: Wednesday 25 November, 2015 by matthew c.
Thank you Indy for another great pair of Adventure Pants. Anyone who wants a pair of these, look no further, they are the best!.. Date Added: Monday 10 November, 2014 by MarCus F.
Date Added: Monday 09 June, 2014 by Dale D.
It’s all about the silhouette. Besides the celebrated fedora, Indy’s pants are the most distinguishing feature of his classic profile: loose, rumpled, and baggy; an image most exemplified in the famous Raiders production still of Indy posing stoically with his bullwhip on the Well of Souls set. The khaki pants flow down from his belted waist in a cascade of drapes and folds, perfectly combining the vintage aesthetic of elegant sloppiness suited to a 1930’s-era archaeologist. I can say without a doubt that Magnoli’s Indy adventure pants reflect this look with 100% accuracy. Guaranteed. Back in the early days of the hobby, I had eagerly collected four sets of Indy clothes from M.B.A. Ltd., naively thinking they would be suitable for the rest of my life. However, I didn’t have the foresight to realize that I might someday outgrow them! My first course of action was to seek out the best alternative: Wested Leather, which inherited the Indy clothing line after Noel Howard passed away. All the reviews universally praised Wested’s pants as the best option for the Last Crusade look, which I was striving to achieve. What I received, however, was a bit different. The material and workmanship was on-par with Noel’s pants, but the details were off. The color was too dark for LC, the belt loops were misplaced on a sewn-over waistband, and (critically) the legs were too tapered. The pants were very nice, but my satisfaction was only temporary. I wanted genuine LC pants, determined to have them once and for all. The final alternative was to have a new pair of Indy pants copied from my original ones. 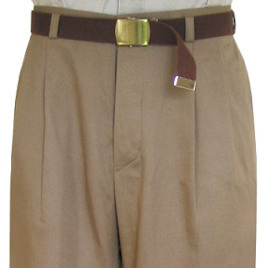 I sourced and purchased 4 yards of tan cavalry twill wool and some vintage WW2 British army buttons that matched Noel Howard’s pants. Sticking with original Indy suppliers, I asked Wested if they would be willing to make a new pair of pants using the material I had, but Peter said they don’t make custom pants, only jackets. My search for a local tailor yielded only alteration shops which didn’t make clothing. I was running out of options fast. Then I recalled Indy Magnoli, a pillar of the original Indiana Jones web community from the beginning. Tony was one of the old guards, along with the likes of Michaelson, Lee Keppler, and Micah Johnson. If there was anyone with the attention to detail to achieve the screen accuracy required by discerning Indy gear aficionados, it was Tony. When I explained my situation, he gladly agreed to accept the job. I mailed off my fabric and materials, custom specs and reference photos for his tailor, and I crossed my fingers for luck. Months passed, but my patience was finally rewarded when the box arrived from Magnoli Clothiers. It was a home run! The measurements are perfect, the fit is great, and the thinner cavalry twill is much more comfortable than the heavy fabric used by Noel Howard. The material breathes easier and feels lighter and airier, much better suited to the climate of the Deep South where I live. Despite the weight of Noel’s original pants, I’m convinced the film-used pants were made of thinner twill. You can really see how the fabric drapes and flows during the action scenes when Indy is running around and fighting. It doesn’t appear as thick or heavy. Bottom line: these really ARE the perfect Last Crusade pants! I am *tremendously* pleased with them. Everything is great: comfort, cut, attention to detail, and quality craftsmanship are positively outstanding. Tony really went the extra mile on these custom-spec Indy pants. Not even Wested, our Indy tailor extraordinaire, would accept my own supplied fabric to make a pair of LC pants. But Magnoli did, and that is why he is unequivocally the king of Indy clothing in the world. If you want a pair of authentic Indiana Jones pants capable of standing up to real-world adventures in style, then look no further than Magnoli Clothiers. It's the genuine article!..